Injuries affect every athlete, from the elite Olympian to the weekend racer. In the moment, a traumatic crash, a torn muscle, or a stress fracture can feel like the most devastating event possible. While some athletes are destroyed by the experience, others emerge from their recovery better, stronger, and more confident than ever. 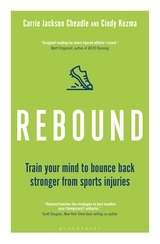 Rebound provides a clear, compelling explanation of psychological recovery from injury and a practical guide to building mental resilience. Weaving together personal narratives from star athletes, scientific research, and the specialized clinical expertise of mental skills coach Carrie Jackson Cheadle, it contains more than 45 Mental Skills and Drills that athletes can use at every phase of their recovery process. These same strategies can help athletes who aren’t currently injured reduce their vulnerability to injury, and enable any individual to reach new heights within their sport and beyond. Running a marathon requires months of training, a high tolerance for pain, and an intimate familiarity with a product called Body Glide. Fortunately for you, watching a marathon involves none of the above! Doing just a little bit of planning and preparing of your own will make things a lot more fun and enjoyable for you on race day, while also allowing you to be the best possible cheerleader, photographer, and crew member for your runner. Matt and Cindy Kuzma—a pair of experienced runners, spectators, and writers—bring you this step-by-step guide to watching your first or best 26.2-mile adventure. Buy it to learn to support the runner in your life. Runners, buy it for your friends and family; place them in our capable hands so you can focus on your race! For more than fifteen years, nutritionist Dawn Jackson Blatner has helped hundreds of clients lose their bad eating habits and step up to optimal health. The key? Not deprivation, but a new kind of gratification, which she calls “super swapping”—exchanging fake foods for wholesome high-quality foods—superfoods. A largely plant-based diet rich in fiber, vitamins, and antioxidants stabilizes hunger hormones, speeds metabolism, and fights disease.